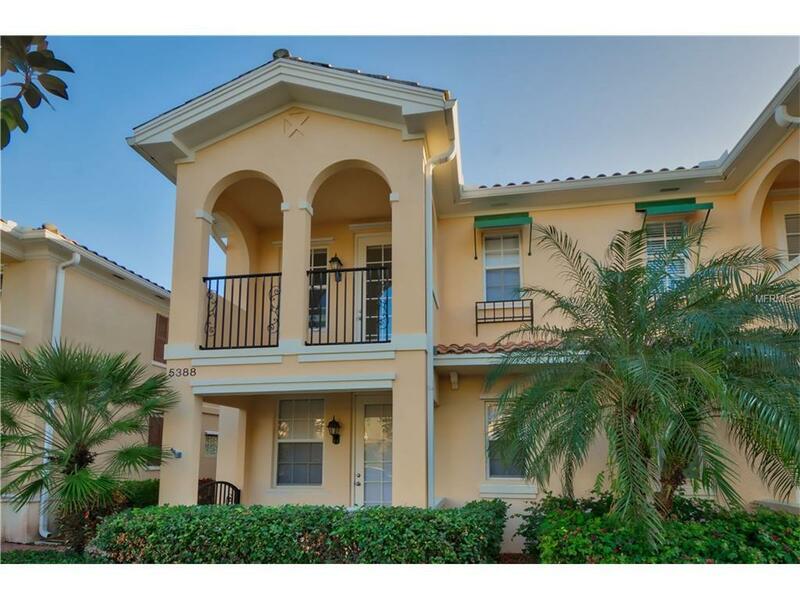 A Mediterranean styled townhome that features 4 bedrooms and 3 full bathrooms, the master suite has a walk in closet with built in organizers giving you plenty of storage space. An open floor plan with a Great room and dining area which is just perfect for entertaining guests. Included central vac system, security system , a two car garage, a screened in lanai and hurricane shutters just to name a few. Enjoy the exceptional views from front porch and balcony! Villagewalk is a gated community with amenities that include: meeting/party/card rooms, state of the art Fitness Center, GEO thermal heated and cooled lagoon Pool, Geo thermal lap pool, gas station, restaurant, hair salon & gift shop. You will enjoy miles of biking/walking paths along our many lakes. Includes some furniture. Close to shopping, dining and Siesta Key beach.